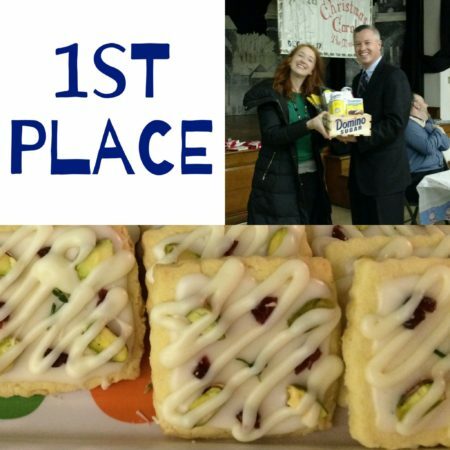 Many thanks once again to Domino Sugar for sponsoring our cookie contest, and to our judges for making the hard decisions and choosing winners! 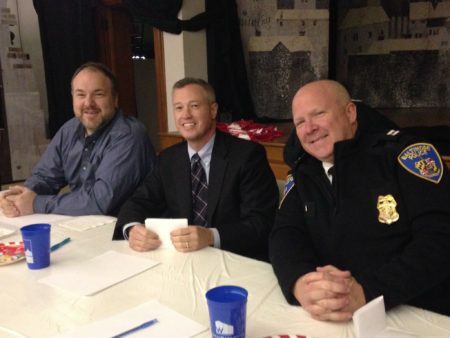 On the panel were Delegate Luke Clippinger, Peter O’Malley of Domino Sugar, and Southern District Captain Sean Mahoney. 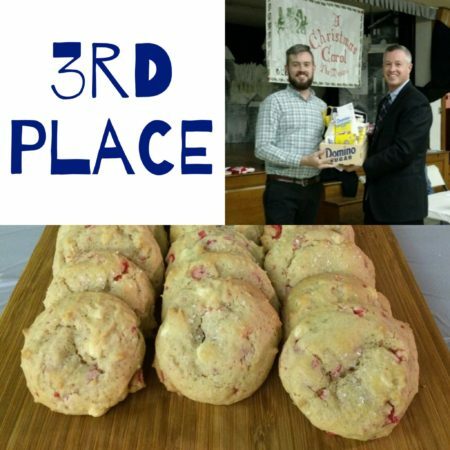 They were tasked with determining the 3 best cookies out of 9, all which were absolutely delicious! 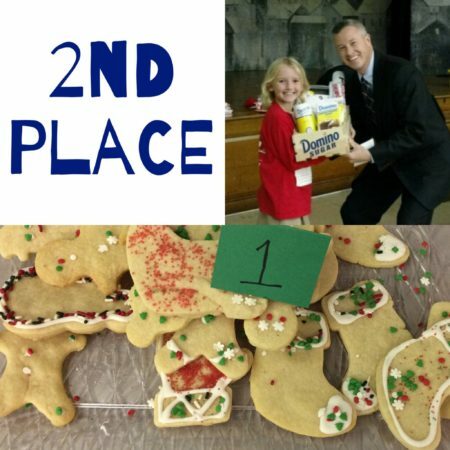 Scroll down to find out who won, and how you can replicate their cookies for your friends and family this holiday season. In the bowl of a stand mixer fitted with a paddle attachment, or in a bowl with a hand-held mixer, beat together the butter, cream cheese, brown sugar, and sugar until creamy, about 3 minutes, scraping down the bowl as needed. Add the eggs one at a time, mixing after each, followed by the vanilla and peppermint extracts. Roll cookie dough into rounded tablespoons (dough will be sticky) and place on the prepared sheet pan about 2 inches apart. Sprinkle with coarse sugar, if using. Bake until edges just begin to turn golden, about 9-11 minutes. Let cool on the sheet pan 5 minutes, then transfer to a wire rack to cool completely. Note: For superfine sugar: add 2 cups Domino® Sugar to blender, process until fine (about 30 seconds) then measure out. 1) Whisk the flour, superfine sugar, & salt together in a large bowl. Add butter to the flour mixture, one piece at a time, while beating using an electric mixer on medium-low speed. Continue to beat until the mixture looks crumbly and slightly wet, 1 to 2 minutes. 2) Beat in the cream cheese & vanilla until the dough just begins to form large clumps, about thirty seconds. Knead the dough in the large bowl by hand a few times until it forms a large, cohesive mass. 3) Turn the dough out onto a clean counter and divide it into quarters. Form each into a four-inch disk, wrap in plastic wrap, and refrigerate for at least 30 minutes. 4) Ensure the oven rack is in the middle position and preheat the oven to 375. Line 2 baking sheets with parchment paper. 5) Working with one disk at a time, roll the dough out to 1/8″ thick between two sheets of parchment paper. Refrigerate again until firm. 6) Working with one sheet of dough at a time, peel top sheet of parchment off then replace it. Carefully flip sheet over and peel off the other sheet of parchment. Using cookie cutter, cut out shapes and transfer to lined baking sheets, about 1″ apart. 7) Bake the cookies until light golden brown, about ten minutes, rotating the baking sheet halfway through baking. Let the cookies cool on the baking sheet for 2-3 minutes, then transfer to a wire rack to cool completely. When cooled, the cookies can be decorated as desired. 8) Repeat with remaining sheets of dough. Leftover pieces can be combined and reused one more time, starting with forming into 4-inch disk Step 3). 9) Once cool, decorate as desired. 1. Whisk flour, cornstarch, baking powder, and salt in a medium bowl. Put butter and granulated sugar into large bowl and beat several minutes, until pale and fluffy. Mix in yolks, lemon zest, and vanilla. Reduce speed to low, and gradually mix in flour mixture. Shape into two disks; wrap in plastic. Refrigerate until firm, about 1 hour. 2. Preheat oven to 350. Transfer dough to a lightly floured work surface. Roll out to 1/8 inch thick. Use cookie cutter to cut shapes and space 2 inches apart on baking sheets lined with parchment paper. Refrigerate until firm, about 15 minutes. Bake until just golden, about 12 -15 minutes. Let cool completely on wire racks. 3. Stir together confectioners’ sugar and lemon juice in a small bowl. Dip surface of each cookie in icing and sprinkle with chopped pistachios and cranberries. Add a tiny sprig of rosemary or a couple small thyme leaves. Allow lemon glaze to set. 4. Heat chocolate chips and milk in the microwave in 20 second increments, stirring vigorously in between, until chips are melted. Put in pastry bag (or plastic zipper bag and snip off end), drizzle over cookies. 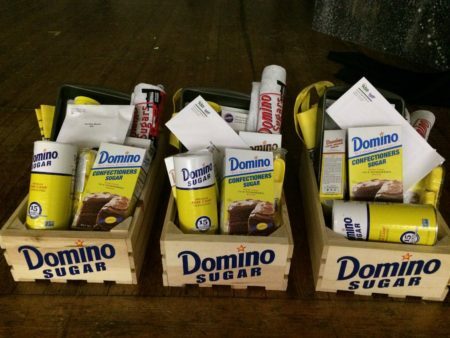 In addition to the Domino Sugar products and swag, winners went home with gift certificates to the Wine Market, Das Bier Haus, and Dessert Fantasies! Sweet! 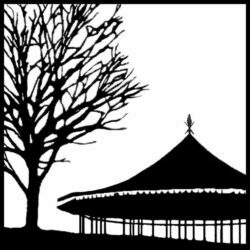 Congratulations winners, and happy holidays to all!